On a recent Thursday, we found ourselves back in the village of Mattituck, standing on Love Lane. We’ve written before about Love Lane businesses like the Village Cheese Shop and Bookhampton, but there is a lot more to see on this little street. Take a look at the Love Lane passport to see what the merchants are offering. Our first stop was one we had been waiting a long time to make. We’re talking about the Love Lane Market. 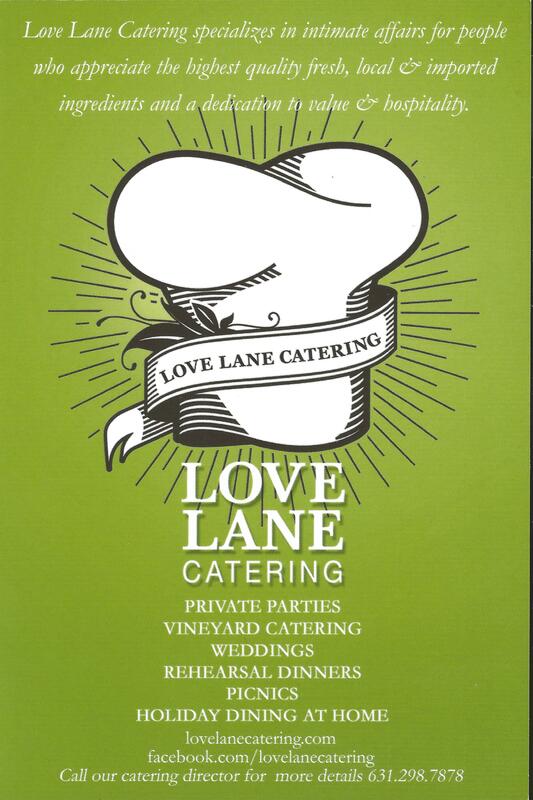 We were glad to see the Love Lane Market thriving again. The shop suffered gravely at the hands of Hurricane Sandy. It took proprietor Michael Avella more than seven months to get the market flying again, and it looks terrific. The rotisserie duck, wood-fired pizza, and other tasty offerings are up and running. Shelves are full of spices, rubs, condiments, pastas, and the like. The appetizing case looks, well… very appetizing. It is full of charcuterie, salads, and other treats. Even better, the Market offers wine touring picnic baskets. This fall, we will be trying one, and reporting on how we enjoyed it. Meanwhile, with the help of Michael we found our dinner-to-be. Both of us enjoy grilled sausages, and we spied some beautiful examples in the appetizing case. When we learned that Love Lane Market features local artisanal sausages, we snapped up some hot Italian, and a ring of cheese and parsley pork sausage. Home they went in the cooler bag we always take with us on our trips around town. Bring a cooler bag with you, and you will be able to take advantage of the serendipitous food and wine discoveries you are sure to make. Guess what we had for dinner. Sausages! Here is how we got the best from the wurst. I (Stu here) like to use a Weber charcoal grill and an indirect grilling approach for sausages. 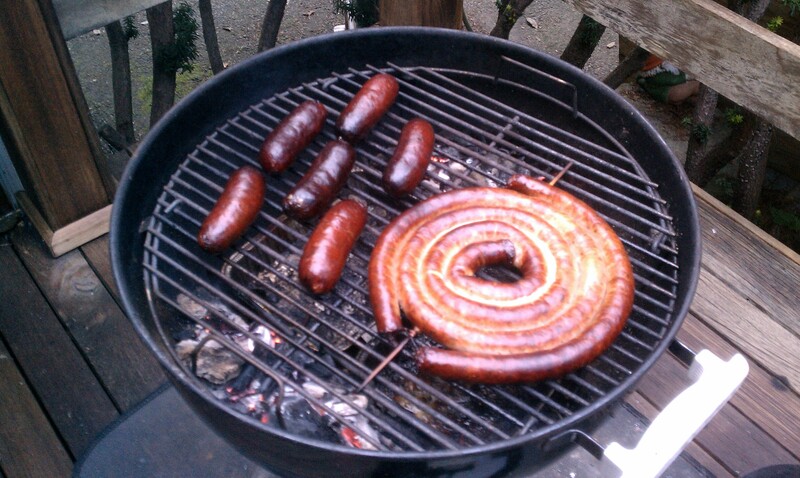 With indirect grilling, charcoal is banked to either side of the grill, and the food, in this case sausage, is placed in the middle of the grill. With the domed top in place, the heat of the charcoal cooks the sausages without exposing them directly to flame or heat. In addition to indirect grilling, I also like to add some wood smoke to the party. 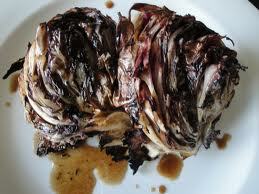 For this BBQ I used one cup Apple wood chips, which I soaked in water for several hours. 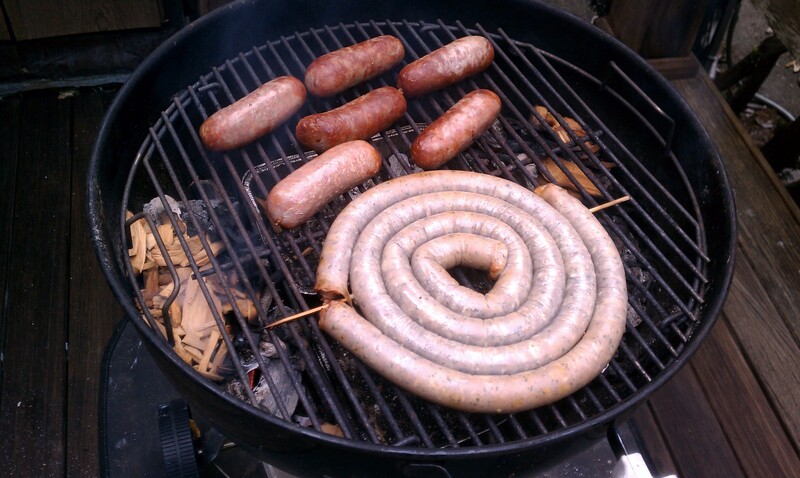 If you plan to smoke your sausage, use wood specifically packaged for smoking. Forget that old fence post or that piece of treated lumber. Those won’t do at all! For this amount of sausage, about 30 minutes under the cover is about right. 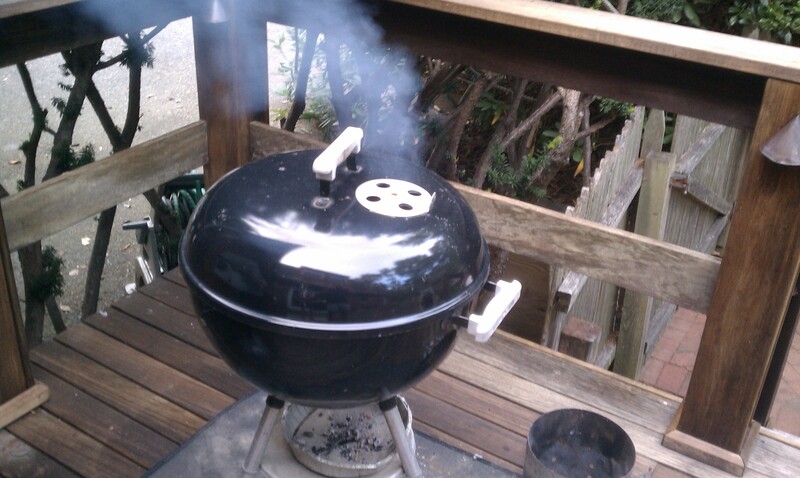 With the top and bottom vents open, the grill will reach about 375F, and generate plenty of smoke flavors. Weber will tell you “If your’re lookin’, you ain’t cookin” so don’t lift the cover and peek! The heat will escape and the cooking will grind to a halt. I like the sausages to be at about 160F when they are done. Notice how the sausage has taken on a beautiful mahogany color. This is the result of the wood smoke, which has imparted a terrific flavor that complements the intrinsic flavors of these artisanal sausages. To learn much more about these techniques, visit Steve Raichlen, author of the many BBQ books and host of BBQ University and Primal Grill. Steve knows all about grilling, so read and learn. The sausages were nothing short of wonderful. They were full of flavor, but not heavy or greasy. OK, we’re not claiming they are health food, but you can cut yourself some slack now and again. While firing up the pure hardwood charcoal for grilling, I (Stu here) prepped and roasted some local small red potatoes. Cut in half, parboiled for about 5 minutes, drained and tossed with olive oil and sea salt, those potatoes cooked up crispy on the outside and creamy on the inside. What about a green vegetable? Nope, it would be a red vegetable. I cut two radicchios in half, brushed them with (you guessed it) olive oil, and sprinkled them with salt. Then, I grilled them cut side down first, for about five minutes per side. Afterwards, I finished the charred cut side with some of Vines and Branches’ Tuscan herb-infused oil, and a splash of balsamic vinegar. Delicious! But wait, what about the wine? Yes, the wine helps make the meal. This time Marian decided to try a 2008 Coffee Pot Cellars North Fork Merlot. Merlot wouldn’t be your pick for this meal? Well, she made a great choice and the wine worked wonderfully. That was the teaser. We will tell you all about Coffee Pot Cellars winery in a soon-to-come post. Besides Coffee Pot Cellars, we will tell you about a great Love Lane tasting room visit, a terrific Riverhead breakfast spot, a tasting at Laurel Lake Vineyards , and some wisdom on what you should do with your Lambburguesa! Stay tuned, and enjoy your trip around town.